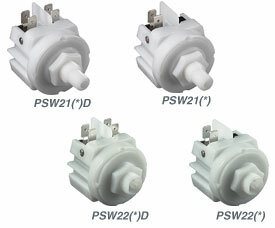 The PSW21 and PSW22 Series have been discontinued. Some stock still remains; please check the specific item you are seeking to see if there is remaining inventory. Please see the Pressure Switch Product Finder or contact Omega Sales for possible alternatives. These compact pressure and vacuum switches are designed and manufactured to exacting standards to meet the needs of OEM manufacturers and instrument makers for a low cost, stable, repeatable switch. Plastic mechanisms and housings are acetal to minimize moisture absorption and maintain dimensional stability. Plastic welding is accomplished using advanced microprocessor controlled ultrasonic welding equipment. All switches are 100% tested at high and low settings and at the proof pressure. Units are delivered with the setpoint at approximately the midpoint of the adjustable range. Custom pressure switches are available, with a 50 piece minimum order; please consult Pressure Engineering for price and delivery. Cusotm options include factory setting at specified setpoint, Noryl switch body, Nitrile diaphragm, and DPDT switches can be configured for different pressure settings. Hysteresis (Deadband): 15 to 25% of the setpoint. Note: Mineral Oil and similar fluids are not compatible with EPDM. Request Nitrile diaphragm (Consult with Pressure Engineering for Custom Switch info). Setting: The Pressure Switch is field adjustable using the hex head set screw at the center of the pressure switch (PSW 21/22-WRENCH). The Vacuum Switch is field adjustable using the Phillips head screw on the switch carrier. Dual Pressure Switch: The DPDT (two switches) will both change state at approximately the same setpoint. On DPDT units, one switch may be set to lead or lag the other (see Custom Switches above).